Austrian boffins in the small town of Gratkorn have developed a concept of the future of cars, together with Swiss tuning specialist Rinspeed.Imagine a car which can come by itself to pick you up from the pub — and you don’t even have to give it an address, because it’s integrated with the GPS in your phone. Sounds like science fiction? An Austrian research lab in Styria — part of the $40 billion Dutch semiconductor manufacturer NXP — has developed the shape of things to come, and put it on the road. Developed with Swiss tuning experts Rinspeed, the Tesla-based vehicle is striking, with the usual clean, aerodynamic lines of modern fully-electric autos. It’s under the hood where the most interesting innovations may be found. The “connected car” is Internet enabled, and like the Google-powered self-driving cars in the US, the NXP Tesla has autonomous driving, and special technology for potential hazard detection — including the ability to talk to traffic infrastructure and other smart cars to learn about problems before your vehicle arrives there. Entertainment is of course highly personalized, and naturally there’s no key–instead, you open your car with an NFC-enabled smart phone. Low battery is no problem, because the car has a built-in wireless phone charger too. One very cool feature mooted by the chip maker is special delivery. Imagine you’ve just ordered a package from Amazon, but don’t have time to pick it up from home before you fly off on a business trip. Instead, tell Amazon to deliver it to your car. The delivery person will be guided to your vehicle via GPS, and when they get there, the car will open the trunk automatically to accept delivery. None of this innovation will come cheap, so for the near future, only luxury-class vehicles are likely to see features like these come to the market. NXP assure car buyers that they’re building banking-level security into the car, to prevent hackers from taking over. 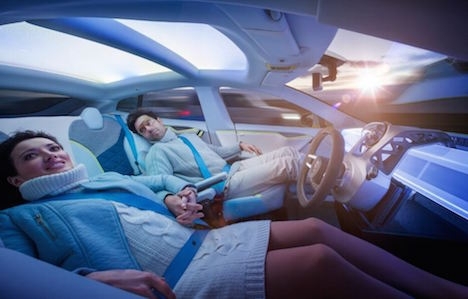 Sadly, however, NXP’s vision of the car of the future depicts a woeful fashion sense, as the models seem to have a naff taste in designer clobber–but the car itself is very tasty indeed.